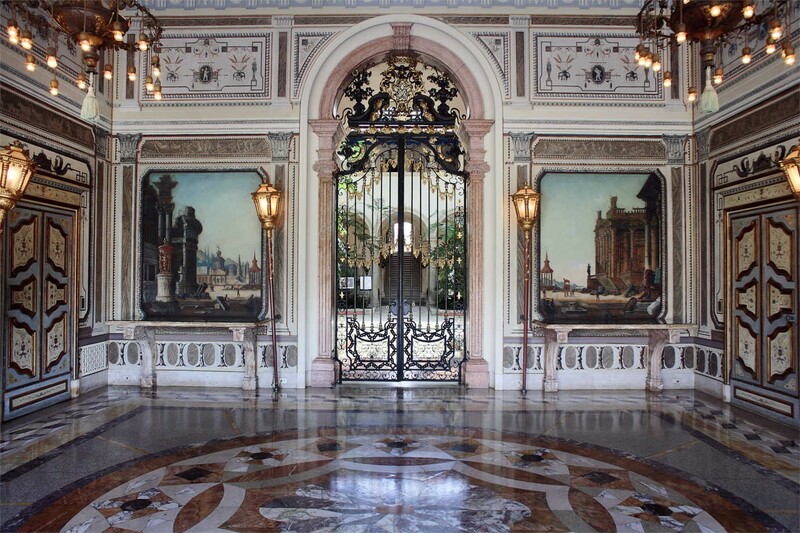 An elaborate stone barge frames Vizcaya, the Gilded-Age estate built by James Deering. 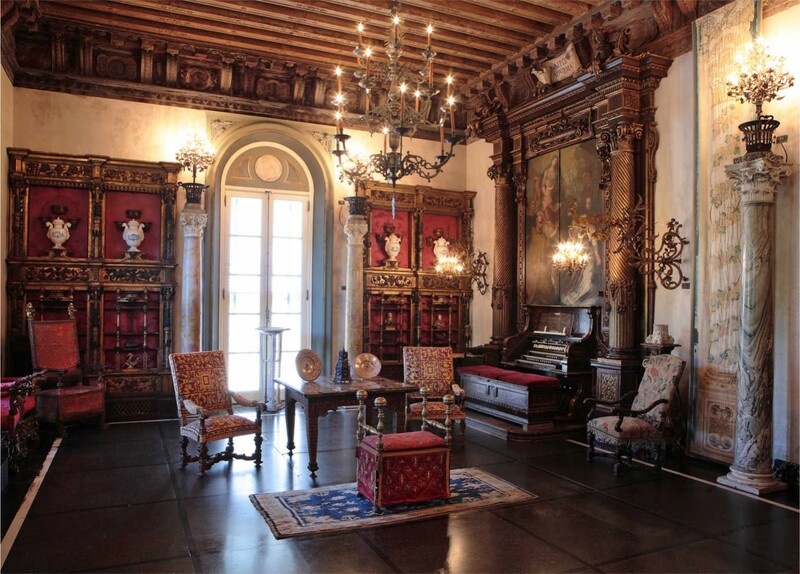 NEH funding has helped Vizcaya conserve its historic collections and monitor the estate's interior environment. Image courtesy of Vizcaya. 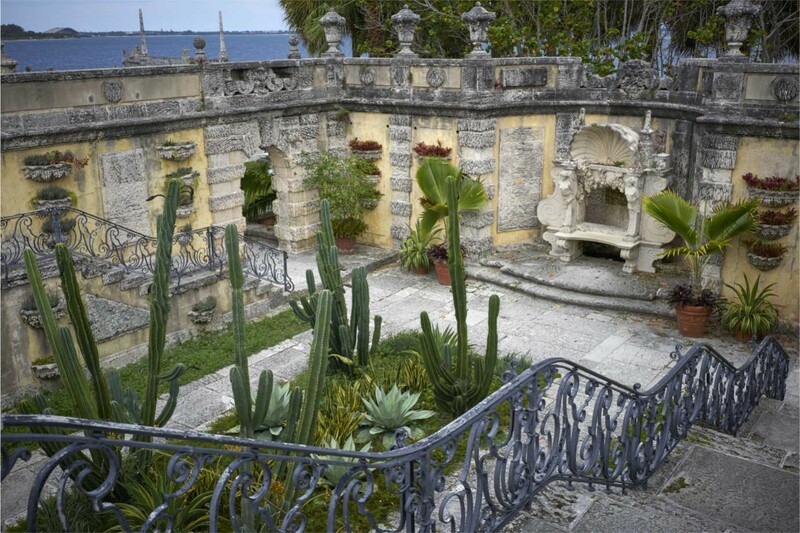 Vizcaya Museum and Gardens is a National Historic Landmark, house museum, and public garden. Built between 1914 and 1922, Vizcaya was the winter home of American businessman James Deering and was conceived to appear as a centuries-old European Villa. It is as spectacular an example of Gilded Age design as it is a repository for a diverse collection of decorative and fine art spanning more than 2,000 years. But because it sits on the shores of Biscayne Bay, Vizcaya and its treasures have been threatened by its marine environment since it was constructed. Though hurricanes pose an obvious and dramatic threat, deterioration caused by sustained high humidity, salts, and relentless sun presents a persistent challenge. A work crew recovers elements of Vizcaya's stone barge, which were submerged and damaged during Hurricane Irma in 2017. Image courtesy of Vizcaya. A seating area inside the mansion. Image courtesy of Vizcaya. A walkway inside the mansion. Image courtesy of Vizcaya. Sculptures on the estate. Image courtesy of Vizcaya. A courtyard at Vizcaya. Image courtesy of Vizcaya. 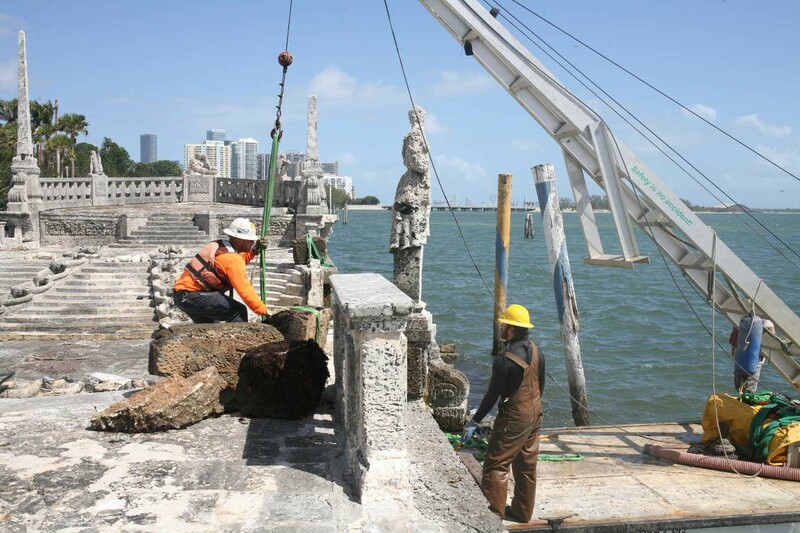 Most recently, Vizcaya received an NEH Chairman’s Emergency Grant to help recover and restore elements of the Barge—an architectural feature situated in Biscayne Bay, which was damaged by Hurricane Irma in September 2017. The process included salvaging and restoring elements of the Barge that remained submerged after the storm. Two other NEH grants have helped Vizcaya preserve its historic collections by making conservation plans for its works of art on paper and purchasing digital data loggers to better monitor the estate’s interior environment in advance of an HVAC upgrade. A time-lapse video captures Vizcaya's barge as it withstands Hurricane Irma. Video courtesy of Vizcaya. In addition to helping Vizcaya recover from a significant natural disaster, these grants helped Vizcaya strengthen its efforts to preserve the historically-valuable materials that supplement the estate’s artworks and furnishings. 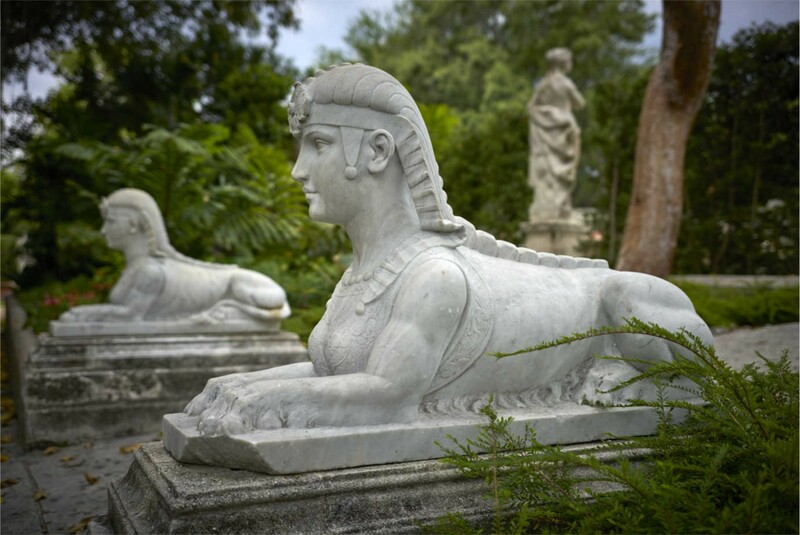 Vizcaya possesses an extensive archive that documents the creation and construction of the estate. Early photographs and more than 30,000 pieces of Deering’s correspondence with art dealers and his chief designer, architect, and landscape architect retain the history of Vizcaya’s treasures and its construction. In the past, this knowledge has helped the estate preserve and restore its showpieces. Now, it is helping Vizcaya as it embarks on a new project: the restoration of the estate’s village, including its staff residence and working spaces, which will help Vizcaya tell new stories about its past.